When he first came to Philadelphia, Andy Reid was a fresh-faced quarterbacking guru taking on his first head coaching assignment in the National Football League. Filled with big ideas and a flair for offensive creativity, Reid may just have been the ripest and most filling of all the fruits on Mike Holmgren's vaunted coaching tree. He nurtured the Eagles, through difficult harvests and bountiful seasons alike. Fatefully paired with a rocket-armed youngster from Syracuse many didn't want, "Big Red" presided over the most enduring period of success in the franchise's history. That times seems now over. A lack of winning the big one, a penchant for ego-driven decision making on the field and in the board room, and general unsteadiness at the wheel have hastily tossed the red flag on Reid's tenure. But to focus on the negative is to set one's course in darkness. 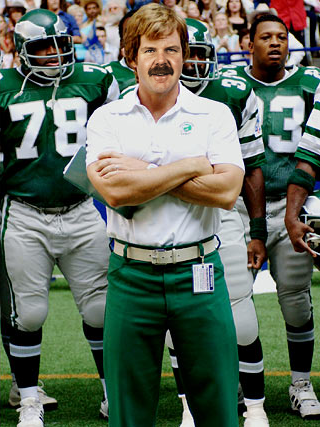 Andy Reid was to Philadelphia a light. And so today let's remember the youngster from California that foolishly challenged his way into our hearts, undaunted by reason or fear--but with the good sense to thoughtfully waste a timeout--before making sure we knew the time was ours. For it is in that famous and often-mocked catch phrase that Reid truly spoke his genius. Time is short, he seemed to warn. Beware! Let us share in it, embrace it. The time was mine. But now it's yours. The time is ours. May he find peace with Michael Martinez.